The Elder Scrolls V Skyrim came out on 11/11/2011. I remember I bought the game for Steam on launch day. I finally “finished” it after 350 hours of gameplay and seven years real-time. “Finished” in this case means “achievement complete”, not just “main quest complete”, because as any Bethesda gamer knows, that’s not how their RPGs roll. I had been looking forward to this game because I had previously enjoyed both ES4: Oblivion and Fallout 3 on PS3 and had also just finished Fallout: New Vegas on Steam and was open to more open-world exploration. I remember being tempted by the badass collector’s edition Alduin statue too but opted out due to price and the fact that it was huge. My first character was a male Nord named Hunter. I actually managed to finish the main quest a bit more than a month after getting the game (fairly fast!). I used that first character to complete all the guild quests – Companions, Mage’s Guild, Thieves Guild, Dark Brotherhood. Afterwards I immersed myself with the open world and toyed around with mods for a bit. I played it on and off again for a few years, and buying the DLC expansions (Hearthfire, Dawnguard and Dragonborn) eventually when they were on sale. I started a few other runs but never got far. In 2016, I started my final run – the character that I would be able to bring to “achievement completion” including all DLCs. This final character was Arche, an Imperial (named after the Tales of Phantasia character). My final armor set was the Deathbrand from the Dragonborn expansion since I was trying to level up Light Armor. Telekinesis – with enchantments to reduce MP cost, you can use Telekinesis to quickly level up Alteration, simply by levitating an object in front of you until you run out of magic, then you just rest and repeat. This method was still fairly slow for me though and more importantly it was really boring. I read some posts saying you could speed up this process by levitating an object then doing fast travel to a far location so that the game thinks you were using Telekinesis during the entire trip, but I could never get this to work and that feels a bit too exploit-y for me. Giant blocking – basically go find a camp with high level giants, then keep blocking their attacks with your shield, healing when necessary. The advantage of this is that it increases multiple skills – Block, Restoration and Light/Heavy Armor (depending on what you’re wearing). However, it wasn’t much faster than the Telekinesis method and it was also quite tedious and if you weren’t careful, you could die. Finally, I came upon, in my opinion, the single fastest way to level up in Skyrim: the Illusion mastery spell Harmony. You can use Muffle to level up your Illusion until you learn Harmony, but once you have Harmony, things go into overdrive. You simply go into the middle of Whiterun (near the plaza is fine, or that big tree in the middle section) and cast Harmony. The spell has a very, very wide AOE so it affects almost all citizens, gaining you ridiculous amounts of Illusions skill levels. A single casting can earn you as much as 50+ Illusion levels. This method is quick, safe, easy, and I wish I had discovered it earlier. As it is, it took me from 68 to 81 in around an hour. Forgotten City – this mods add a self-contained quest that involves time travel, groundhog day-style time loops, multiple paths to resolution and investigating a mystery. It was so good it got turned into its own standalone game. Stan Bush combat music – basically replaces Skyrim’s combat music Stan Bush’s songs “The Touch” and “Dare” from Transformers The Movie, giving you a quick adrenaline boost when combat starts. 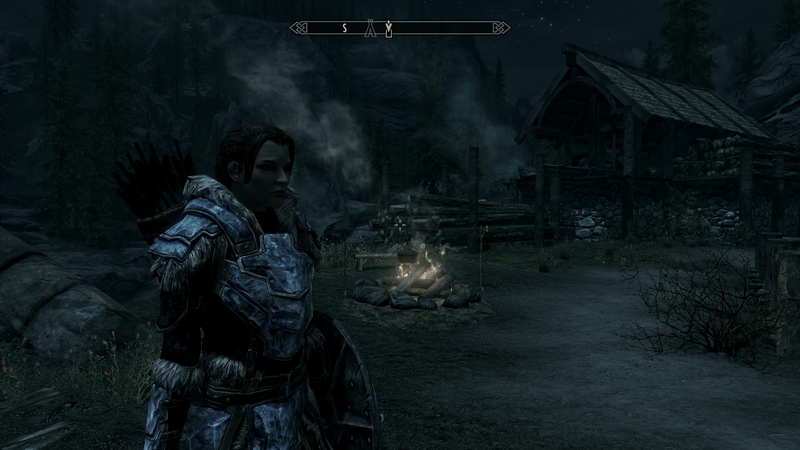 I didn’t actually notice that Skyrim had separate combat music before I installed this mod! That’s it, out of literally two hundred mods only two stood out for me lol. Mountain climbing – okay, this wish is straight from Breath of the Wild. One of the best things about BOTW was the ability to climb anywhere, a refreshing addition to an open world overworld after Skyrim’s “How the heck do I get to the top of this mountain” challenge. More immersion in the Hearthfire DLC – don’t get me wrong, I liked the Hearthfire DLC, it added a nice opportunity for role-playing with the chance to get married and adopt kids, makes for some nice stories and fun moments like this. After a while everything falls into a rut though, it would have been nice if they had expanded the Hearthfire content with some additional radiant quests. Some random ideas: Your wife or one of your kids goes missing, you have to find her; bandits threaten your house and you and your family have to defend it; you gave one of your kids two many daggers and now he accidentally stabbed one of his friends; your entire house has vanished along with your family! It has been teleported somewhere! Actually just more radiant quests in general would have been nice for a bit more variance (I’m not sure if I will ever be satisfied). I think there’s already mods that do this, but I never tried them out. The ability to take over a fort after you clear it. Skyrim has a lot of small forts or buildings held by bandits or whatever, it would have been a nice alternative to buying a house, after you clear a bandit the Jarl of the containing hold offers you a chance to buy/earn the title for the hold. Once you own a hold, whenever you recruit new followers you can choose to send them to the hold instead of following you around, and same as the house you could build improvements like a smith, stables, etc, and earn money from shops maybe?